CHICAGO – The Chicago White Sox have traded designated hitter Adam Dunn and cash considerations to Oakland in exchange for right-handed pitcher Nolan Sanburn, a Kokomo high School graduate. Sanburn, 23, is 3-1 with a 3.28 ERA (26 earned runs/71.1 innings pitched), six saves and 73 strikeouts in 42 relief appearances this season with Class A Stockton of the California League. The 6-foot-0, 175-pound Sanburn has thrown 2 innings or more 21 times for Stockton. His White Sox assignment has not been determined. The former Wildkat is 4-5 with a 2.93 ERA (39 ER/120.0 IP) and 118 strikeouts in 65 games (nine starts) over three minor-league seasons. Sanburn was ranked by Baseball America as the No. 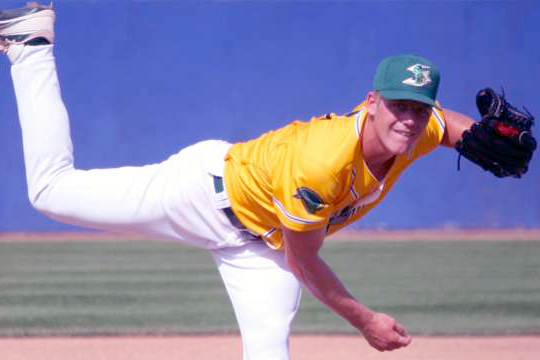 10 Prospect in the A’s organization entering the 2014 season and the No. 10 Prospect by MLB.com entering the 2013 campaign. Sanburn was selected by Oakland in the second round of the 2012 draft out of the University of Arkansas. Dunn, 34, is hitting .220 (80-363) with 20 home runs, 54 RBIs and 65 walks in 106 games with the White Sox this season. He owns a career .237 (1,617-6,817) average with 460 home runs, 1,158 RBIs, 1,091 runs scored and 1,311 walks over 14 major-league seasons with Cincinnati (2001-08), Arizona (2008), Washington (2009-10) and the White Sox (2011-14). Dunn ranks 36th all-time in home runs and 42nd in walks. Among active players, he ranks second in walks and third in homers.